Class 1,000 clean rooms are the second lowest classification in Federal Standard 209 standards. The International Organization for Standardization (ISO) equivalent standard of Class 1,000 clean rooms is ISO 6. Some of the primary applications that Class 1,000 clean rooms are used for include inspection, patterning and integration tools like non-contact profilometry, flip-chip integration, thin-film deposition, and laser micromachining. 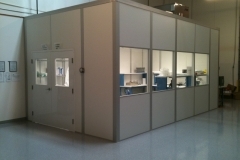 As a result of these diverse applications, Class 1,000 clean rooms are utilized in industries including pharmaceutical, scientific research, medical, electronics, semiconductor, food processing, and industrial manufacturing. However, since Class 1,000 clean rooms are lower level clean rooms, they may have all of the requirements for certain higher-grade applications. For instance, they may not have an air shower at the entrance and may not require individuals to wear special shoes, although some still do; everyone wears a head-to-toe bunny suit to keep skin and hair particles out. Some of the many contaminants that Class 1,000 clean rooms are used to keep out include human hair, dust particles, paint, air conditioning debris, lint, skin flakes, and lubricants. The most common sources of these contaminants are people, tools, fluids, the facility, and the product that is being manufactured. In order to keep these pollutants out and meet the standards of strict regulations, acrylics, steel, stainless steel, aluminum, and polycarbonate are generally the materials that are used to fabricate the walls of Class 1,000 clean rooms. 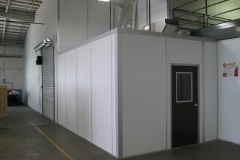 This class of clean rooms can be any of the 3 major designs of clean rooms: ballrooms, which are large and open rooms that are parts of the actual building; modular, which is a temporary and small room within a room; and soft wall, where the walls are made of tightly stretched or free-hanging fabric. In addition to availability in any of these designs, Class 1,000 clean rooms may also range in size from huge, open spaces to tiny chambers. Temperature control and electrostatic discharge control are just a few of the other options that are also possible in this class of clean room. >Class 1000 Clean Rooms Class 1,000 clean rooms are rooms in which the concentration level of airborne particles is controlled so that they never exceed 1,000 particles per cubic foot.